It’s been forever since I posted. I know. Some exciting news is coming. Until then, I just wanted to show off a progress photo. 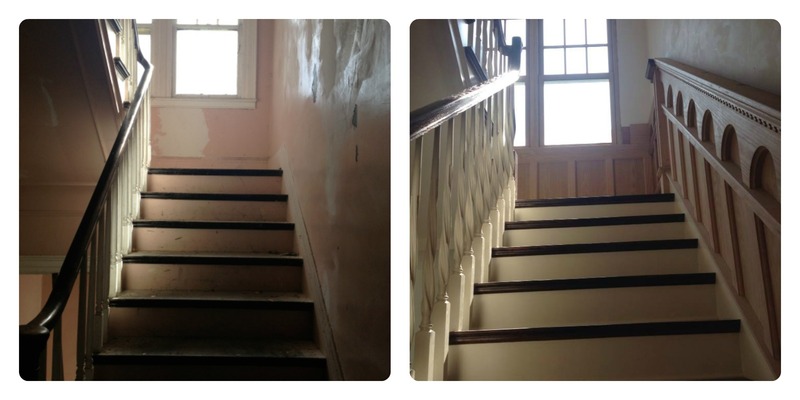 To the left are the stairs when we bought Matilda; to the right are the stairs today. You see the wainscoting running up the wall? Yeah… the contractors built that custom to mimic what we pulled out of the First Unitarian Church on Woodward before it burned down. Our only regret: Our choice of balusters. We loved the organic shape of these when we selected them, but they in no way go with the very heavy wainscoting, which came later. There are parts of our house that are sort of schizo like that. I guess that’s what makes it ours. More church trim being installed. Looks great, Amy. I enjoyed shopping photos of your home to Suzanne and her girls when they were here the past two days. Hang in there! The best is yet to come! Arthur Herzog was a family friend since the 1950s. He was a wonderful story teller and a great cook. Because of his connections, I saw Elvis Presley rehearse at the Fox Theater when he was first starting out; and my teens and early twenties were filled with jazz festivals, and nightclub concerts. Arthur is truly missed! I certainly hope to. It’s just been hectic with work and construction. Looking forward to more updates! I recently bought my first house, an old farmhouse in need of all updates, and I’ve drawn both inspiration and succor from your stories.